Already dreamt about it and ready to start backpacking? No rush! Just spend 5 minutes to discover some essential data and useful information about the Long Trail! Explore everything you may need to know during the hike: from historical facts and trail guides to the most popular online resources. Now let’s go back a century to 1910. It is this year that’s considered the starting point for the Trail. Here are a few historical facts about Vermont’s Long Trail. 1. Where the history begins. The history of the trail remains inseparably linked with the founder of the Green Mountain Club, James P. Taylor. In March 1910, 23 enthusiasts created this club. The primary goal of the Green Mountain Club was the popularization of Vermont hiking trails. 2. 209 miles for the first decade. The club volunteers did not sit idly. In just the first ten years of the Green Mountain Club’s existence, they built as many as 209 miles of trail. In 1920, the first shelter, Taft Lodge, was constructed, which is still the largest hut among all of the Long Trail shelters. Up to 24 hikers can be accommodated here without compromising their comfort. The number of club members continued to grow over the years, and two decades after its founding, in 1931, the volunteers created the Long Trail Patrol. The primary purpose of the patrol is to support and protect the Long Trail System. Every year, dozens of volunteers are assigned by the club to work in the Long Trail Patrol. 4. Carry-in, carry-out policy. The next thirty years were marked by the popularization of hiking in Vermont. Unfortunately, one consequence of this growth in interest was significant contamination of the trail. Therefore, the management of the Green Mountain Club decided to instate a carry-in, carry-out policy in 1966. The implementation of these rules allowed—and continues to allow—the path to maintain its original form. 5. Recognition of the Green Mountain Club. In 1971, 46 years ago, the Vermont legislature issued a resolution recognizing the club as the protector and sponsor of the Long Trail System. It also delegated money toward the development of programs for the maintenance and preservation of the trail for Vermont’s people. 6. Further development. In 1992, the Green Mountain Club bought 1836 May Farm, a popular hiking route. For many years, the club had rented this part of the trail. Today the Green Mountain Club continues to manage and maintain the trail, keeping it in excellent condition for hikers. As we mentioned in the first chapter, in its early years, the Long Trail length was 209 miles. And now, it has grown to 273 miles. Like the Appalachian Trail, the LT is divided into six sections. You can find these sections marked on the Long Trail map below. No matter how you choose to visit—hiking the Long Trail alone or with friends; doing a thru-hike, section hike, or day hike; going NOBO or SOBO—you won’t be disappointed with your vacation. The best time to start your SOBO Long Trail thru-hike is in the middle of September. Early autumn in northern Vermont is warm enough, and at the same time, you will avoid the heat as you move south. Don’t delay your journey for long, though—the route can be pretty muddy. NOBOs should start at the beginning of hiking season due to the temperature difference between the southern and northern regions of Vermont. So, let’s start our journey. The length of this section is 64.8 miles, plus 1.3 miles of approach trail. The trail goes over several notable mountains and peaks: Jay Peak, Gilpin Mountain, Domey’s Dome, Buchanan Mountain, Bruce Peak, Haystack Mountain, Belvidere Mountain, Bowen Mountain, Butternut Mountain, Laraway Mountain, Whiteface Mountain, Morse Mountain, and Madonna Peak. You’ll also see Mount Mansfield, the highest point of Vermont at 4,393 feet. During your hike, you can stay in the oldest shelter on the trail—the Taft Lodge. The second section that SOBOs must overcome is 45.3 miles long. You should be sure to prepare because you will not find many towns where you can replenish your water or food supplies. From Stowe to Waitsfield, you’ll hike through Bolton Mountain, Mount Mayo, Dewey Mountain, and Sugarloaf Mountain. You’ll see Mount Clark, Camel’s Hump, Mount Ira Allen, and Burnt Rock Mountain. You will also see Beane Mountain, Molly Stark Mountain, and Baby Stark Mountain. If you are a section hiker, you should take care to arrange transport. To get to the trail, take a private shuttle or taxi or have two cars prepared—one at the beginning and one at the end of the route. To overcome this section, you will need to trek 58.7 miles. This part of the Long Trail, Vermont, is no less picturesque than the previous one. Its main part lies in the Green Mountain National Forest. You will climb and descend Mount Grant, Mount Cleveland, Little Hans Peak, Mount Roosevelt, Mount Wilson, Bread Loaf Mountain, Battle Mountain, Kirby Peak, Burnt Hill, Silent Cliff, Worth Mountain, Romance Mountain-East Peak, Gillespie Peak, Cape Lookoff Mountain, and Mount Horrid. Please note that to get to and from this section, you will also need two cars or a private shuttle—or if you’re feeling adventurous, you can try hitchhiking. This section of the trail is connected to the Appalachian Trail and may seem easier than the previous ones. You won’t have to overcome many mountains, and the average height is just 1,500 – 2,000 feet. The length of this section is 49.8 miles. On the way, you’ll cross Baker Peak, Peru Peak, Styles Peak-North Peak, Styles Peak, Bromley Mountain, and Spruce Peak. While hiking this part of the Long Trail in Vermont, you’ll also see Spring Lake, Bear Mountain, White Rocks Mountain, Homer Stone Mountain, Rams Head, and Little Killington. Your path will run along the shore of Griffith Lake. If you’d like, you can also take a side trail and walk to the Peak Walkway. To overcome the section between Route 30/11 and Route 9, you will have to hike 40.1 miles. You’ll see Prospect Rock, Stratton Pond Peak, Little Stratton Mountain, Glastenbury Mountain-North Peak, and Hagar Hill from the trail. You should expect several climbs and descents to and from Stratton Mountain, Little Pond Mountain, Glastenbury Mountain, and Maple Hill. The final part of the Long Trail thru-hike is only 14.3 miles long. However, you will also have to follow 3.8 miles of the Appalachian Trail to get to Williamstown or North Adams. At the end of the SOBO hike, you will pass Harmon Hill, Consultation Peak, and Seth Warner Mountain. You will see Scrub Hill and Lake Hancock. Catch the bus from Burlington to the Waterbury Park and Ride, Jeffersonville, or Saint Albans, and then take a private shuttle to the northern terminus. Please note that the bus schedule may be subject to change. Therefore, be sure to check the Green Mountain Transit website or call at (802) 864-2282. Hikers may stay at one of over 70 Long Trail shelters on the way. Volunteers from the Green Mountain Club take care of huts along the entire trail. You can find more details about their locations from the Long Trail guide published by the club. North Troy Inn Bed and Breakfast: This hotel is located about 4 miles east of the northern terminus. The room rate varies from $30 to $45 per person depending on the type of room. By the way, North Troy Inn B&B also offers an organic breakfast. Jay Peak Resort: This complex provides a variety of services for both hikers and ski enthusiasts. The Lodge is located near the eponymous Jay Peak. The price depends on the chosen room and starts from $213 per night. Phineas Swann Bed and Breakfast: This cozy inn is located in Montgomery Center. Prices vary from $159 to $189 per night. This deluxe inn, unlike many other luxurious hotels, is pet-friendly. Moreover, your dog can enjoy a pet spa (for the additional fee of $95). Grampa Grunts Lodge: This lodge offers affordable rooms starting from $45 per person for one night. A fantastic breakfast is also available for only $5. You can find Grampa Grunts Lodge in Montgomery Center too. Sunset Motor Inn: The Sunset Motor Inn is located 9 miles east of the trail to Morrisville. This family-owned hotel offers affordable accommodation starting from $129 per night. Smugglers’ Notch Inn: This inn is situated 8 miles away from the LT in Jeffersonville. You can expect affordable accommodation with prices starting from $99 per night. Green Mountain Inn: Hikers who are tired after long climbs and descents will love this inn. Here you will find the soft bed you dreamed about during your hike. The occupancy rate starts from $149 per night. The hotel is located in Stowe. Richmond Victorian Inn (Bed and Breakfast): This inn is located in Richmond. A family-run Victorian hotel, it is also pet-friendly. Room prices from November to April range from $139 to $159; from May to September—$149 to $169; and during foliage season—from $179 to $199 per night. Old Stagecoach Inn: Immerse yourself in the historic atmosphere of Vermont at the Old Stagecoach Inn in downtown Waterbury. This inn is listed on the National Register of Historic Places. Room prices range from $100 to $170 per night. Tucker Hill Inn: In this eco-friendly hotel (in Waitsfield), you will find not only a soft bed but also a delicious breakfast. The inn has achieved AAA’s three-diamond status, and room rates start from $139 per night. Millbrook Inn: This hotel is also located in Waitsfield. The room rates start from $250 per night. The Old Hotel: This hotel is in Lincoln, 5 miles west of the Long Trail, VT. The occupancy rates (bed and breakfast) start from $65 per night. Chipman Inn Bed and Breakfast: This inn is located in Ripton, just 5 miles from the trail. The hotel has welcomed guests for more than 40 years. The room prices start at $129 per night (for a single occupant). Pumpkin Patch Bed and Breakfast: This hotel boasts 170 years of history. Located in Rochester, this B&B’s room rates range from $135 to $170 per night. Inn at Long Trail: This is a famous hiker hotel in Killington, located just about a mile east of the LT. Occupancy rates depend on the season and start from $90 per night. Comfort Inn Trolley Square: This smoke-free hotel in Rutland offers affordable accommodation for tired hikers. Occupancy rates start from $85 per night. Green Mountain House Hiker Hostel: This hostel in Manchester Center is a typical hikers’ hitch. For them, special prices are available, from $35 per night. Do not forget to make a reservation 3 to 4 days before your arrival. Bromley View Inn: This Inn in Manchester Center offers rooms starting at $89.25 per night for a single room and $114.75 per night for a standard double room. Knotty Pine Motel: This hotel in Bennington offers affordable rooms, ranging from $84 to $129 per night. A swimming pool is also available. Holiday Inn: If you decide to finish your SOBO hike in North Adams, the Holiday Inn is at your service. Occupancy rates range from $137.20 to $186.20. Williamstown Motel: If your final stop is Williamstown, stay at this inexpensive motel. The room prices vary from $69 in the summer and $54 in the winter. Do not forget to make a reservation. If you decide to go for thru-hiking or section hiking the Long Trail, then think about lightweight backpacking. The trail is close to towns where you can quickly resupply your food and drinks. You can also find grocery stores and restaurants. Some hikers even send themselves mail drops to the nearest post office. A few inns, lodges, hotels, and outfitters stores also accept mail drops. The lighter your backpack, the easier your way will be. We can’t forget to tell you all about the local food. When planning your long trail hiking, be sure to try out four of the region’s must-taste foods. 1. Vermont maple syrup: Did you know that maple syrup can replace white sugar in drinks and baked goods? Moreover, it is much healthier than white sugar or honey. Vermont maple syrup contains natural minerals like calcium, manganese, potassium, and magnesium. Maple syrup is sometimes called “Vermont’s Official Flavor.” For more than 100 years, members of the Vermont Maple Sugar Makers’ Association have been making this tasty syrup. 2. Vermont cheese: Vermont is famous for its cheeses. There are 49 cheese farms within the state where some of the world’s most delicious cheeses are made. The Vermont Cheese Council has even created the Vermont Cheese Trail Map, with dairies and tourist stops marked. More than 150 types of cheeses are produced in Vermont. 3. Ben & Jerry’s ice cream: The history of this ice cream brand began almost 30 years ago. And since then, the small business of just two guys has grown to an international scale. For Vermont tourists, trying Ben and Jerry’s ice cream is a must. You can also plan an ice cream factory tour! Check the schedule of tours on the company’s website. 4. Long Trail Ale: Each trail in the US has its own brand of beer, and Vermont’s Long Trail is no exception. The Long Trail Brewing Company produces 22 varieties of beer, and pub and visitor centers are open to tourists daily. As we mentioned in Chapter 2, the trail can be quite muddy. You may need to resupply not only food and drinks but also some of your hiking gear or clothes. Olympia Sports offers both gear and clothes. This store is located in Manchester Center. You can make an order both online and offline. Mountain Goat Outfitter is a store with more than 20 years of history. It’s located in Manchester Center. You can place an order on its website or buy necessary equipment in person. Please note that the website does not list all the products that are in stock. Additionally, Mountain Goat Outfitter accepts mail drops. Base Camp Outfitters in Killington is an offline store only. Here, you can find outdoor clothing and gear. Base Camp Outfitters also accepts mail drops. Mountain Travelers Hike and Ski Shop in Rutland is an offline Outfitters store with 41 years in business. The shop does not accept mail drops. Clearwater Sports in Waitsfield is a retailer of outdoor clothing, gear, and accessories. The shop accepts mail drops. Umiak Outdoor Outfitters has two locations—one in Stowe and one in Richmond. Here, you can find new and used hiking gear. Both locations also offer rentals and accept mail drops. The Green Mountain Club Headquarters and Visitor Center in Waterbury Center offers not only GMC maps and guides. Hikers can also expect personal advice and a warm, friendly atmosphere. The center accepts mail drops. Before sending a mail drop to any store, however, please contact them via phone or email. Before you start your hike, you’ll need the Long Trail guide and map. Wondering where to buy them? Green Mountain Club: Long Trail Guide, 28th Edition: For only $19.55, you will receive an updated Long Trail guide with a detailed trail description and maps. The most recent edition was published in 2017. End-to-Ender’s Guide 2017, 21st Edition: This guide is designed for thru-hikers. In it, you will find a detailed description of trails, shelters, maps, and services in the cities along the trail. The guide costs $9.95. Day Hiker’s Guide to Vermont: This guide was published in 2011. 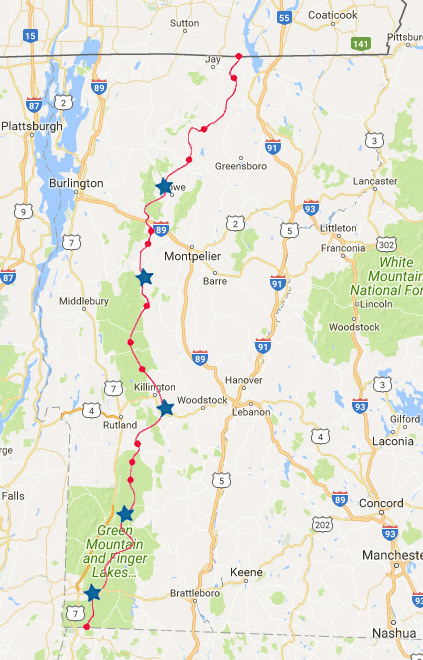 You will find information about each section of the LT, as well as all recommended Vermont hiking trails for day trips. Useful tips are also included. The book costs $18.95. Nature Guide to Vermont’s Long Trail: Discover flora and fauna of the trail. You’ll find here detailed descriptions and photos of 200+ species. You can purchase this guide for $21.95. Winter Hiking Guide to Vermont: Discover winter hikes in Vermont with the Green Mountain Club’s hiking guide. You will find detailed information on trails and routes, as well as useful tips and hiking distances. The guide costs $16.95. Vermont’s Long Trail Map 5th Edition: Waterproof: Discover the Vermont with the Green Mountain Club’s map. You will find up-to date information about shelters and locations, suggested day hikes. Price: 12.95. Weather forecast: Don’t forget to check the weather before you go to avoid surprises. WhiteBlaze: This forum is devoted not only to the LT but to hiking in general. You can get a lot of advice from experienced hikers and even find a hiking buddy. LongTrailHikers: This Facebook community welcomes anyone who loves the trail and enjoys hiking. It does not matter whether you are a novice or have already completed the Long Trail thru-hike several times—or even if you’ve only dreamed about it! Photos, stories, etc. are appreciated. Jeffrey Howard is a hiker, cyclist, and adventure-seeker. He’s always up for exploring new places, from one-day hiking trails to multi-month cycling routes. Jeffrey goes places few people ever visit and tells true travel stories that don’t sugarcoat it. He has abundant experience in equipment reviews and guide writing.